Republished from Shearer Painting 2011. Spending time and energy choosing the right paint for a project makes perfect sense. What’s easier to overlook is another vital step in the process: selecting the right paint roller. A roller’s anatomy is simple: There’s a handle, a cylinder, and a cover for the cylinder. The handle should be made of steel; its grip should be plastic or wooden and able to accommodate an extension pole. The cover should be held firmly in place, but it should also be easy to remove. A better roller leads to a higher-quality finish and faster, simpler cleanup. A good roller can reduce the amount of time you spend on a job, sometimes by as much as several hours. Rollers range in width from narrow “slim jims,” often used to paint the wall behind a toilet, to 18 inches. The typical roller, however, is around 9 inches wide. Obviously, the proper width for a given job depends on that job’s demands. Roller covers merit your attention, too. Good covers have seamless plastic or phenolic (treated cardboard) cores, which resist moisture, and are made with glue that stands up to solvents in paint (and thus keeps the cover’s nap, or fabric, on its core). On covers with polypropylene cores, the nap can be affixed to the core via thermal fusion, also known as flame bonding – a particularly strong form of attachment. It’s best to use one core for oil base paints and another for latex. Then there’s what not to look for. Foam rollers leave a cratered finish due to air bubbles and should be avoided. So should covers with untreated cardboard cores, which lose their shape after enough contact with moisture. 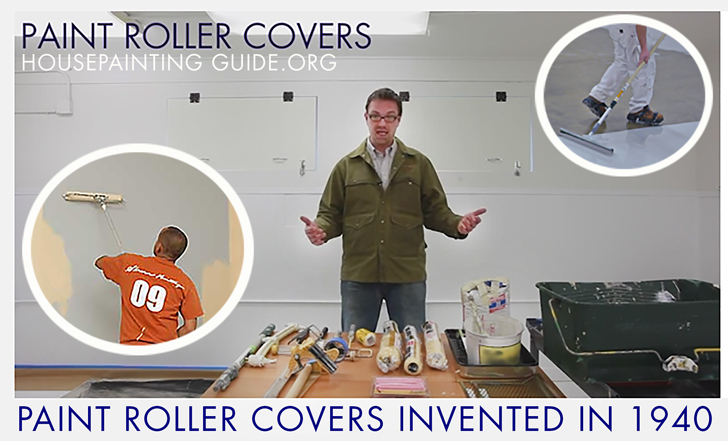 It’s also important to choose a cover that won’t leave roller marks or lint on the walls you’re painting. The nature of a project should dictate your roller cover’s nap length – the length of the fiber ends on the fabric’s surface. If you’re painting new drywall or a similarly smooth surface with high-sheen paint, a 1/4- or 3/16-inch nap will provide the smoothest finish. Putting matte or eggshell paint on drywall that’s been painted before? A 3/8- or 5/16-inch nap will hold a decent amount of paint while minimally stippling (texturing) the surface. (The most versatile nap length is 3/8 inch, which works well with most paints and walls, as long as the roller is high quality.) On medium-textured plaster – or any textured, previously painted surface – a half-inch nap is effective. Finally, rough surfaces like concrete block demand a 3/4-inch nap or greater. A nap’s density matters, too. The denser it is, the more paint it can carry without splattering, and the more evenly that paint will be spread. (A slow, steady rolling action minimizes splatters, too, as does a roller shield.) Lambswool and sheepskin covers are dense enough to hold a lot of paint and work well on textured walls. Lambswool does especially well with alkyd paints, but it doesn’t play nicely with latex. Microfiber or mohair covers, on the other hand, apply smooth paint evenly to a smooth surface. Use natural-fiber covers with oil-based paint; artificial fibers work well with any kind of coating (except epoxies or polyurethane). If you’re planning to paint from ceiling to floor, an extension pole will help you put an even coat on the walls. Between coats, store roller covers by wrapping them in a plastic bag, sealing them in a second bag, and keeping them in a cool, dark place for several hours, or even overnight. Once a project is done, clean roller frames and covers with soap and water and save them for the next time you paint. A cheap roller isn’t worth the price, since it makes a project more frustrating and time-consuming. Inexpensive rollers can leave a wall mottled and flecked with lint – no one’s definition of a job well done. Like most aspects of painting, picking a roller is trickier than it might initially appear. If you consider the factors mentioned above, however, you’ll almost certainly choose the right roller for the job.